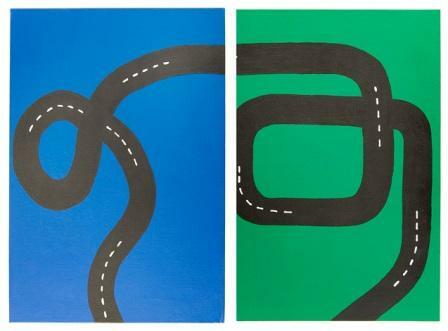 Use acrylic paints and flat canvas sheets to create road play mats for cars and trucks. These sheets also work as decor for kids with a love of all things with wheels. 1. Use foam brush and Kelly Green to paint one canvas; let dry. 2. Use foam brush and True Blue to paint remaining canvas and let dry. 3. Place canvases side by side. Refer to photo and use pencil to draw outlines of roads on canvas. 4. Using pencil line as guideline, use foam brush and Lamp Black to paint roads, using smaller brush for any touch-ups. Let dry. 5. Using White Americana Acrylic Writer, paint random dashed lines along center of roads; let dry. 6. Spray canvases with Americana Gloss Spray Sealer and let dry. Canvases can be laid on floor for playtime or attached to wall for decor, using adhesive to attach cars permanently. i made something similar for a friends two boys for Xmas. I used old sheets and sewed batting between the sheets. I painted the sheets with fabric paint and made several felt items, tree's, houses, pumpkins, etc., which I used fabric glue to secure. The maps had their home site and roads going to places they frequent, such as the beach, the lake, Xmas tree farm, Pumpkin farm, the mountains for their offroading, even their schools. They loved them, plus I sewed a pouch to the mat to store their cars. Mom loved it because it was washable and kept everything together. The boys loved it, because it was a toy they could take on vacation and play anywhere. Thanks for all your great ideas, they spark my creativity all the time.